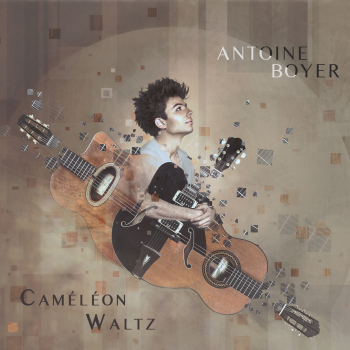 Caméléon Waltz, the title of Antoine Boyer’s new album, gives us the key to his approach. We know that one of the characteristics of the chameleon is its capacity to change color ac-cording to its moods and emotions. In this album, Antoine changes guitar throughout twelve short and intense pieces, all recorded solo (a perilous project, as no dubbing or re-recording was used). Nylon strings guitar on four tunes, steel strings guitar or electric jazz guitar on each of four others; three types of guitar that are also reminiscent of the three beats of the waltz. Antoine blends six covers of great musical variety, all performed with his own original arrangements, and six very personal and inspired compositions. Six in major keys, six in mi-nor keys, half of them binary, half of them ternary. However, no esoteric intent in this near-perfect balance; only a very precise approach aimed at exploring each guitar’s various sound possibilities. Using chords and melody, arpeggios and picking techniques, Antoine explores in every piece the polyphonic capabilities of the guitar, which he plays like a pianist (his admiration for Bill Evans is no surprise, as he covers We will meet again and dedicates Waltz for Bill to him). His approach, working simultaneously at rhythmic, melodic and harmonic levels, yields great uni-ty. These twelve demanding meditations, sometimes full of gravity, blending irresistibly po-werful episodes with more peaceful moments, reflect a rare interiority and intensity for a 21-year-old musician. This isn’t only about guitar but also and especially music, played by a poet of the strings who-se brilliant technique never ceases to serve musical aesthetics. Antoine Boyer has been billed by most major gypsy jazz festivals in Europe and the United States and has shared the stage with such renowned musicians as Philip Catherine, Angelo Debarre, Stochelo Rosenberg, Christian Escoudé, Ra-phael Faÿs, Tim Kliphuis, Jon Larsen, Adrien Moignard, Robin Nolan, Paulus Schäfer, etc. Antoine performs regularly in duet with Samuelito, Gustav Lundgren Trio and is regularly invited to play with many artists. He also studies classical guitar with Gérard Abiton in Paris. He is the winner of the 2015 Montigny Classical Guitar Contest. He has been nominated “révélation Guitare Classique 2016″ by the french ma-gazine Guitare Classique. Antoine Boyer & Samuelito won this year the “4th European Guitar Award” in Dresden.